Since the 1960's, genre film has been associated with stock characters and cliches and was often overlooked or completely dismissed by critics. In the last decade, more critics have taken notice of genre film because innovative people have been retooling the forms. Clint Eastwood's "Unforgiven" revealed a depth to the western that was sorely lacking in other films. Tarentino toyed with the gangster flick in "Pulp Fiction" and the result was a screenplay that will be discussed in film classes for at least the next decade. Kiyoshi Kurosawa (no relation to Akira Kurosawa) is a 15-year veteran of genre film and his horror films "Seance" and "Cure" show a new direction in the horror genre arena. These are quiet films that rely on the tension of the scene rather than gore or crescendos. There are creepy surprises that are dealt with in the most delicate of ways such as using a long shot rather than the Hollywood close-up for mayhem. I had a chance to speak to Kurosawa through his interpreter when he was in Seattle a while ago. Q: When you became interested in film were you more interested in genre? re-interpretation of the serial killer film. K: When I first started making films I was at the University and I made 8mm films of my own. At that point I had no notion of genre films, so the length ranged from 10, 30 to 60 minutes. After that I edited it and that's how long a film it was. When I entered the world of commercial filmmaking, I realized that there were time constraints. Most films needed to tell their story between 90 and 120 minutes and I began to think seriously about why they had that time constraint. Whether a film portrays a single day of events or an epic story, it's the same length basically. I started to unravel what that mystery was. It's really the genre approach to filmmaking that dictates that length. Although I certainly don't believe that the length of a film should be dictated, and certainly there are Hollywood films that are longer these days, but if you're going to somehow tell a story within 90 and 120 minutes, I think that the conventions of genre can be very helpful to you. Also, in the different ways that you tell a story, through the conventions of genre you can abbreviate unnecessary passages or emphasize others. Q: There was a trend towards ultra-violence in Japanese film in the late 80's and 90's. "Tetsuo" (Ironman) by Shinya Tsukamoto is a prime example. 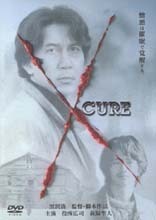 In, "Cure," there is ample room to exploit the violent aspects, but instead you only show the result. Is this in reaction to the earlier movement? K: My approach as a filmmaker is that whether it's a scene of violence or as a conversation or a meal, I want to shoot it the same way. In that sense I don't employ special techniques for introducing violence. I have no interest in portraying violence as being a different or separate part of any other scene that's been on. Q: Is independent film encouraged in Japan? Is there funding through the government or private organizations? K: There is no government funding. The Tokyo Film Festival and a few other places make some feeble attempts at support, but I think in Japan, it's to the advantage of independent filmmakers that they are bereft. They rely on their own resources and this has weeded out the wanna-bes. Although Japan is a very wealthy country, in terms of conditions of filmmaking it's still very poor. People are still very hungry in that sense. In Japan, making one movie won't make you rich and famous, so you have a chance of actually making something worthwhile. Q: "Cure," was very different from what I expected. What was the inspiration behind this film? Did you have an interest in hypnosis? K: I think that most humans live with deeply repressed rage and hate. We are repressed by things such as conventions and morality. I used hypnosis as one of the tools to tear away at those conventions. Q: Many directors have an alter-ego. Hal Hartley has Martin Donovan for example. Do you have an actor that you prefer for your leads--one that you identify with more than others? K: I don't have a specific alter-ego, but the lead role is played by Yakusho Koji who happens to be the exact same age as I am. Q: Have you used this actor before? K: Actually, "Cure," was the first time I used him. In between making "Cure" and "Séance," I cast him as the lead in "Charisma." Also, I cast him as a secondary character in "License to Live." Q: You also wrote the screenplay for, "Cure." How much of yourself did you insert into the character Takabe? K: Only that he is a very average man. His occupation is a detective and that certainly is not mine and I've never dreamed of killing anyone. Takabe is about the process of him slowly shedding his morals and exiting the conventions and morality that bind us to social engagement. The question that I wanted to solve in, "Cure," was, how far can an "every man," like myself, go from that social structure. Q: You worked with the late Juzo Itami ("Tampopo," "A Taxing Woman," "The Funeral"). When did you work with Itami and on which film? K: When I made "Do Re Mi Fa Girl," I cast him as who he was then, an actor. He hadn't become a director yet. Meeting and talking with him it became very clear to me that he really had a deep love of film. He stated that if he had the chance he wanted to make something on his own. I was much younger than him and I was just making my second film. I had lots of ideas for films I wanted to make and even though he was much older, it seemed that he might be able to work for me someday. Later, he went on to make films and despite the fact that he made them out of a genuine love of filmmaking, he turned into a "Hitmaker." I continued to associate with him, but as he grew rich with every film that he made, I watched him go from a filmmaker that loved to make movies, to a filmmaker that made movies to make money. Q: Do you worry about this happening to you? K: I have never experienced making a lot of money from a film. I caution myself that acquiring a lot of money is something that can change a human being and I don't want to end up the way he did. So far, it's not a concern. I'm not driven by material things.